Looking for polo shirts? You've come to the right place! Qtag supplies a huge range of high quality yet cheap polo shirts for men, women and children from a wide selection of top polo shirt brands. 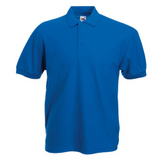 We supply cotton polo shirts, long sleeve polo shirts, mens polo shirts and much much more, all at wholesale prices. With super fast delivery and no minimum order, ordering wholesale polo shirts online has never been easier. The polo-shirt has been a fashion phenomenon for over a decade, becoming a necessity in the wardrobes of men, women and children. Easy to wear as everyday clothing it is also often worn statement piece. You may decide to wear the polo-shirt as a casual garment, for sport, but it also looks just as elegant matched with different trousers for elegant occasions. Our polo-shirts come in a range of colours and materials and bring a fresh take to the everyday t-shirt. Styling options are limitless, wear your white polo-shirt underneath an open black jacket so you can see the polo-shirt underneath. In the summer months the polo-shirt is a perfect option teemed with shorts, choose a vibrant colour and add excitement to your outfit. A comfortable and elegant top for women too, consider tucking it into a skirt or layer it with a tank top. Whatever the occasion you can be sure that there is a way to style your polo-shirt to make it an appropriate choice. Our range stocks polo-shirts from the world's leading brands, renowned for their quality, but also value. With polo-shirts from brands like Fruit of the Loom, Gildan, Uneek and Jerzees you can be sure to find a polo-shirt style and colour that is perfect for you. All of our polo-shirts are listed at wholesale prices and the come with an exceptional service guarantee, the best quality at the cheapest prices, delivered straight to your doorstep. For mens polo-shirts, womens polo-shirts, cotton polo-shirts, cotton/poly polo-shirts and kids polo-shirts you won't find a better deal, whatever your needs. As we purchase directly from the manufacturer and we purchase polo-shirts in bulk qualities we can offer low prices you won't find elsewhere. 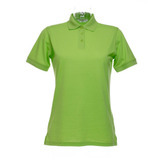 If you increase the quantity of the polo-shirts you are buying you will save more. Quantity discounts start after buying just three polo-shirts. Our warehouse is fully stocked at all times to ensure you can get your items as fast as possible. We only stock t-shirts from brands we are proud of. All the t-shirts we sell are from leading brands like Jerzees, Fruit of the Loom and Uneek. Order whatever you need – even if its just one polo-shirt! We have no minimum order quantity so you can order exactly what you need with no price consequences. We have worked hard on our website to make online shopping as easy and trustworthy as possible. You can complete the whole process online and there is no need to pick up the phone. However if you do need any extra help at all, our friendly staff are available to ring Mon-Fri, 9-5 to answer your queries.